The Mignon 4 appeared in 1923 and would remain in production until 1934. It was the most succesfull in the series. The only difference between the Mignon 4 and the number 3 was the addition of a backspace key to the right of the mechanism. Some 200,000 Mignon 4s were produced between 1923 and 1934. The machine was a major success, and not only in Germany. The Mignon 4 was exported to France, the Netherlands, England, the US and other countries. Different models were built for different markets. The French market, where Mignon had to compete against copies that were first produced in the USA (see Yu Ess) was pleased with several frivolous Mignons in different colors. 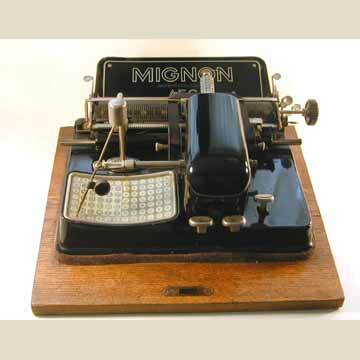 There was a "folding" Mignon, with a retractable pointer mast and at least one nickel-plated model. In 1934 the last Mignon came off the AEG assembly line in Berlin.